All songs by Donovan P. Leitch, except 05 by Buffy Sainte-Marie, 06 by Jane Bowers and 07 by Aaron Zeitlin, Sholom Secunda, Arthur S. Kevess and Teddi Schwartz. 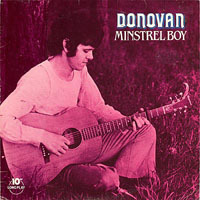 · In 1983, PRT Records issued some of Donovan's 1965 Pye recordings titled Minstrel Boy. · The album was released as a 10" LP.